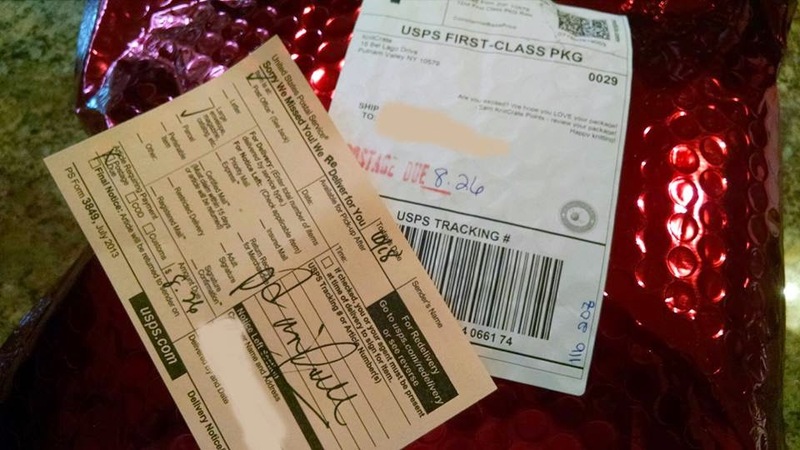 Here is my blog post about my missing KnitCrate parcel - ordered in May 2014 and never received, and similar behaviour of deleting a query I made on their Facebook wall and ignoring a Tweet, and ceasing all email contact since July. Thank you for your post on our company. You did omit though that we asked several times for the paid postal service receipt so we could refund that amount of money. We never received it. The above orange ticket is not enough proof to the IRS when writing a check to an individual. You must have a paid receipt for proof and explanation. The above emails you copied and pasted were sent in an effort to figure out how such expensive postage could be charged on a package that was so light. Please be accurate and fair in your reviews. Joe Raetzer replied to a customer service issue I had with them recently, too, and was equally unhelpful. It seems his wife or sister (? ), Andrea Raetzer, posted in the comments here with a similarly awful attitude. (I'm surprised that Andrea is using the IRS as an excuse to not reimburse you for the small amount of postage. In my own business, that's an excuse I'd never allow, and I've never heard that from any other business. It frankly doesn't make a difference, but I guess it sounds great as an excuse.) I ordered a subscription as a gift and thought I had cancelled it, using their confusing billing portal. When it auto-renewed, I tried cancelling with 24 hours, and Joe was polite until I realized he didn't actually cancel the renewal and refund me. Then he quoted from the site's legal language instead of trying to be a human being serving a customer. Seems I was just someone from which he could extract money. I've never had such a harsh response from a customer service person. 1. (I'm surprised that Andrea is using the IRS as an excuse to not reimburse you for the small amount of postage. In my own business, that's an excuse I'd never allow, and I've never heard that from any other business. Right - you can't refund your customer $8? Seriously? Not unless you can write it off (which you couldn't ANYWAY because it was clearly YOUR mistake!!) How just plain awful. 2. Seems I was just someone from which he could extract money. I've never had such a harsh response from a customer service person. That's all these people are in it for and they do have horrible attitudes. I wish I had found this review before doing business with their company! I have had several problems and their customer service never responds. I am so frustrated and don't know what to do. I am so sorry to hear that they did this to another person! I would contact the Better Business Bureau and report them. If you paid with Paypal, file a dispute. If you paid with your credit card, file a dispute with them. Best wishes on getting things resolved! We saw your review on the January Indie KnitCrate – thank you for your thoughts! However, we would like to encourage constructive criticism in our reviews. We feel that referring to the colorway as “vomit” was less than constructive. The Mashed Berries colorway is in very high demand – we’ve been inundated with requests from KnitCraters, customers and others to purchase the colorway (it’s selling at a fast clip for $72 per skein which is more than your subscription rate!)." While I appreciate the offer for the refund and whatnot (I had already used one of the products and would have also had to pay return shipping), it's just plain WRONG to slap your customers on the hand for honest reviews. I didn't say anything inappropriate, by the way. Next: Dec '13 Indie KC - the yardage on the yarn I received was way short. I checked my gauge 100 times. Also, there SHOULD be enough yarn to make a gauge swatch, there was not. There was no room for error, apparently. When I contacted, I was told to contact the YARN MANUFACTURER!! I didn't buy the yarn from them (they were equally as unhelpful, told me basically that I was full of it and my gauge must have been off). I got about 2/3 of the way through the project only to run out of yarn and be told both by KC and by the yarn manufacturer that I was SOL. Nice. I've also received some really shoddy products from them (because I stupidly kept going back for more). One being a wood ruler with their logo on it that I come to find out is marked incorrectly! I can't remember exactly what the issue was but it was something like, at the double digits, whole numbers were marked at half inch increments. Ok, so that's useless. I didn't even bother contacting them, it was like a year until I actually noticed (and this was a product that I BOUGHT, not from a crate). I also bought a one-off crate and received an electronic row counter. It was the cheapest, chintziest thing I'd ever seen AND it didn't even work! Left a review about it, no one ever contacted me. Again, didn't want to deal with Joe. I will NEVER order from this company again. It's really hard for me to believe they are still in business with their attitudes. So glad I read this review. If you don't have good customer service, especially in an impersonal on- line business you should close your company. I will not do business with this company. Thank you.